Hitler's Escape There always have been doubts as to Hitler's alleged suicide in his bunker in Berlin on April 30, 1945. The most authoritarian doubter was the Russian Dictator Joseph Stalin who was convinced that Hitler escaped to Spain in April of 1945. We now have a serious and well researched book by H. D. Baumann and Ron T. Hansig entitled "Hitler's Escape" in which he makes a very convincing case that Stalin was correct in his statements to his western Allies in 1945, telling them that Hitler (and Eva Braun) were still alive. 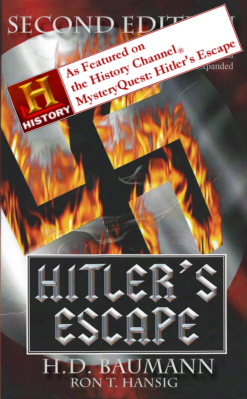 One of the authors' startling revelations is, that the man present in the last days of April inside the bunker was, in reality, a double of Hitler. There even is a photograph of the corpse of the double taken by Russian investigators. Even if one takes the years later submitted Russian report on Hitler's autopsy at face value, there still remains the fact that there was no trace of the corpse of Eva Braun, Hitler's mistress and later wife. This alone disproves the double-suicide theory now part of German history. 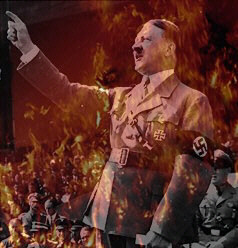 When considering the fate of the German Dictator Adolf Hitler, one has to realize that the overwhelming majority of my readers believe that he committed suicide during the last days of the Second World War. This view is supported by dozens of books written by among others, world-renowned historians. Their views and conclusions are seemingly well supported by circumstances and eye witness accounts. Just the consideration that there may be another, darker side to the story makes us, to say it mildly, emotionally uneasy. Just the thought that such a man responsible for the murder of millions, might have escaped unscathed from the rubble of Berlin in 1945 seems hard to swallow. The Gestapo chief Heinrich Mueller told his US CIC interrogators in 1948, that he arranged Hitler's escape from Berlin and that Hitler together with Eva Braun flew to Barcelona, Spain on April 26th, 1945. Soviet Marshall J. Stalin in 1945 told many Allied Leaders that Hitler escaped from Berlin. There never was an identifiable corpse of Adolf Hitler nor of Eva Braun. The whole suicide story of Hitler rests solely on the concocted testimony of four fanatical Nazis. 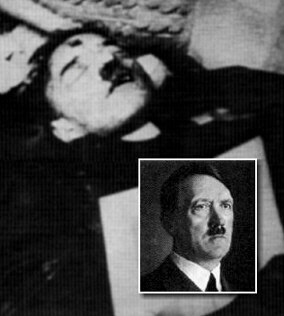 The Russians found the buried (and un-burned) corpse of the double of Adolf Hitler near the bunker. "Hansig and Baumann are not conspiracy theorists, they set out the evidence clearly and logically- and invite the reader to make up their own mind." "Baumann gives a scholarly and lucid account of the causes and rise of Nazism, and he paints an unforgettable picture of the personalities involved in the extraordinary final scene of the German tragedy." Copyright © 2004-2014, Ron T. Hansig and H. D. Baumann - All Rights Reserved.